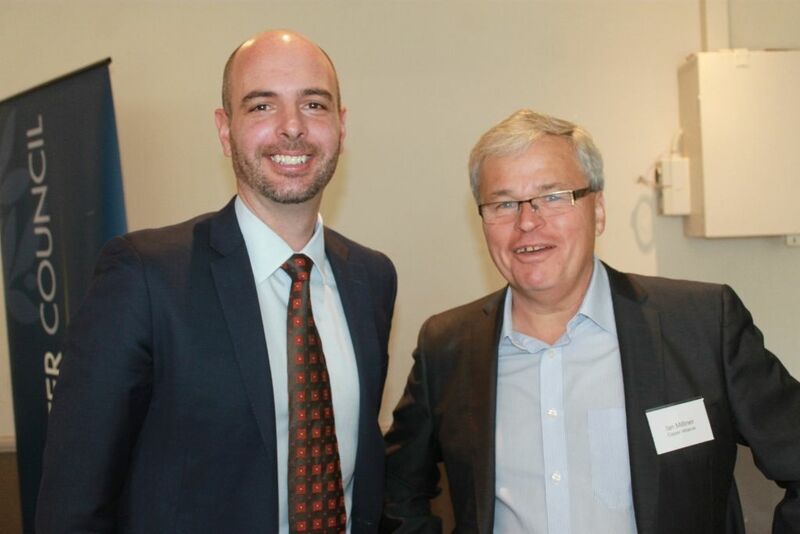 Pictured: Michael Tyler from Australia’s Broadband Network (nbn) with Ian Milliner from Copper Alliance. Ros Marsh – President Avalon Palm Beach Business Chamber, told us on Wednesday - "Ian Miller from NSW Copper Association approached Avalon Palm Beach Business Chamber Inc to initiate this event and advise local businesses on what they need to do to prepare for the NBN rollout. Thanks Ian Miller for getting the ball rolling in Pittwater. Pittwater Council hosted a free update on the roll out of Australia’s Broadband network at the 'Surf Room' in Avalon Beach RSL Club on Wednesday August 12th. The event, supported by Pittwater Business Limited and local chambers of commerce, was opened by Pittwater Council’s Economic Development Coordinator Paul William-Smith who welcomed those present and introduced Michael Tyler, from Australia’s Broadband Network (nbn). Mr. Tyler provided an overview of what nbn.com.au – the company contracted by the Australian Government to roll out the network, are doing, what is involved in the NBN and how it will work to provide fast, reliable and affordable phone and internet services, from a range of providers. The nbn™ network is designed to enable lifestyle enhancements including health, education, well-being, sustainability and wealth. Mr. Tyler reiterated the announcement of December 2014 that Avalon – Bilgola and Palm Beach are scheduled to be made NBN ready – work commencing in early 2016. These works may take between 12-18 months to complete. Mr. Tyler stated that an announcement regarding the rest of Pittwater will occur next Tuesday or Wednesday(August 18-19). NBN Co has determined, as per what is outlined in this, to provide a Multi-technology mix (MTM) to suit each area. "The statement of expectations gives NBN Co the choice of which technologies are to be used in any given areas on a case-by-case basis, so long as they fit within a defined cost envelope. These technologies include fibre-to-the-node (FTTN), fibre-to-the-premise(FTTP), fibre-to-the-basement(FTTB), hybrid fibre coaxial (HFC) cable, fixed wireless and satellite." he explained. In Pittwater, and on the Northern Beaches, there is copper wire. Fibre optic cable technology will replace some of the existing copper wire and HFC networks which use electricity to transfer data to run telecommunications services in Australia. * The nbn™ network rollout currently uses Fibre to the Premises (FTTP) technology in which the fibre reaches all the way to the premises – your home or business. Fibre optic cable is made of glass and uses light to transmit data. Fibre has many advantages, which fit with the nature of our geography and the goal of assisting Australia’s transition to a digital economy, with higher productivity. • Fibre optic cables transmit data over long distances with significantly less loss of quality than copper. • Fibre is resistant to noise and ground currents that can interrupt signals. • Fibre is inherently capable of supporting high bandwidth, which can bring a wealth of benefits including; multiple users being online at the same time and at the same fast speeds, shorter download time, quicker upload time and a smoother online experience**. Michael Tyler also explained that under the Statement of Expectations nbn™ must be guided by the Government’s policy objectives of providing download data rates (and appropriate upload rates) of at least 25 megabits per second to all premises and at least 50 megabits per second to 90% of fixed line premises. Once in place you may approach a variety of Retailers who will determine what speed capacity is available to you where you are as defined by the minimums set above. Cost comes into play there when you decide what you want and will be driven by how much you want to download and what speed you want – some of the larger retailers such as Telstra, will have better equipment that is more up to date, while the smaller retailers, who may suit those on a smaller budget, may not have the same capacity or equipment. For businesses the Technology Choice is also something to be aware of. The Technology Choice Program has been set up for interested individuals, local governments and communities who wish to apply for a change to their nbn™ network infrastructure. It provides an opportunity for eligible applicants to select an alternate technology solution by paying the incremental cost of the change. This is being charged at a cost recovery fee at present. It is expected that the current rollout will meet the bandwidth needs of the vast majority of broadband users, although some individuals and communities may have specific needs for higher speed broadband. Hence, nbn is providing an opportunity for them to move to an alternate technology via the Technology Choice Program. Find out more about this here: www.nbnco.com.au technology-choice-program. If the costs the Technology Choice Program seem prohibitive neighbours in an a Fibre Distribution Area(FDA: A single FDA generally contains up to 200 premises) can band together for an ‘Area Switch’. "If you are in an area where the existing network will be switched off, we will notify you by direct mail that the new network is ready and advise the date on which the old network will be switched off. Therefore, to keep using a fixed line home phone and internet you will need to move those services to the nbn™ network." Moving to the nbn™ network is not automatic and the following services will be permanently disconnected if you do not arrange to move them to the nbn™ network before the advised date. The switch off only affects the above services. If your phone or internet is already provided over another fibre network, such as a network provided by your building owner, private enterprise network, health or education network, or a cable network that's not owned by Telstra or Optus (such as TransACT – excluding ACT customers being migrated to the nbn™ network, OptiComm, Pivit or others), they should continue operating unless your provider advises otherwise. We suggest you prepare before calling your preferred provider so you can discuss all your requirements before ordering your services and booking an installation. Your service provider will be able to advise you, discuss the options and the range of competitive nbn™ plans that they have to offer. After notification that you can switch to the nbn™ network, you will have 18 months to move your services to the new network before the existing network is switched off. The nbn.co will send you reminders, but highly recommend switching well before your disconnection date as it may take time to process your order. If you subscribe to Foxtel Pay TV and it’s provided over satellite or Telstra Cable, it will not be switched off as part of the nbn™ rollout. If you access any Foxtel services via the internet (for example, through an Xbox 360/PC/tablet/smartphone/smart TV), you will need an internet connection in line with Foxtel’s minimum requirements. The only other exceptions to the switch-off are a set of specialised services mainly used by businesses such as as ISDN lines (which are commonly used for PABXs and some EFTPOS terminals), or phone or internet services that are already provided over fibre, or through a network provided by a building owner, or a cable internet network that's not owned by Telstra or Optus (such as Pivit or OptiComm). • ask the equipment or service supplier whether the equipment can be upgraded or reconfigured to work with an nbn™-based fibre service. Pittwater Council’s Economic Development Coordinator Paul William-Smith said that the nbn rollout will provide essential infrastructure for Pittwater, supporting economic development and jobs growth. “Pittwater’s growing creative industries sector, for example, needs access to a fast, reliable network to access new customers and markets, resulting in business innovation. “We have a growing number of home-based businesses that would benefit enormously from fast, reliable broadband, with the advantage of facilities such as video conferencing that remove geographic barriers. Meetings with customers, suppliers, colleagues and networks, can take place regardless of location, potentially saving time and costs associated with travel. “Work, life balance is also enhanced with working from home becoming a real option as we experience fast, reliable internet connection. “In fact nbn has the potential to change the way we live and learn with certain industries such as education changing significantly, with traditional campuses being of less importance, thanks to satellite lectures.” Mr William-Smith added. * Services provided over the nbn™ network will be replacing phone and internet services provided over most of the existing landline networks, including copper and the majority of HFC networks within the fixed line footprint. Services provided over existing fibre networks (including in-building, health and education networks) and some special and business services may not be affected. To find out if your services will be affected, please contact your current phone or internet provider. For more information, visit www.nbn.com.au/switchoff or call 1800 687 626. ** Your experience including the speeds actually achieved over the nbn™ network depends on some factors outside nbn™ control like your equipment quality, software, broadband plans and how your service provider designs its network. 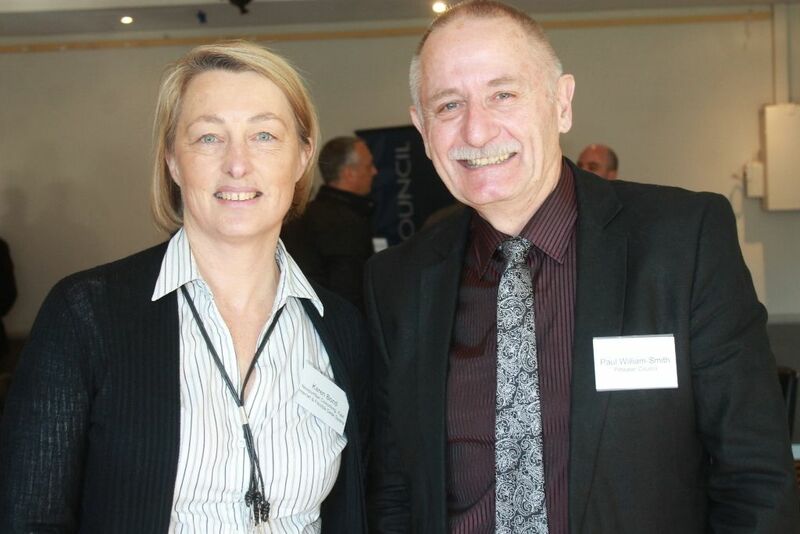 Karen Bond from NewportNet with Pittwater Council’s Economic Development Coordinator Paul William-Smith.